When Harrow Recreation Ground was first opened to the public in 1885, it was predominately as a place for sports. During its early history it was home for many local sports club including 4 cricket clubs, 5 football clubs, 29 tennis clubs and a bowling club and that largely carries through to this day. The facilities in the park have evolved with the sports & recreation fashions and trends throughout the past 130 years. Part of the park that is now football pitches once housed grass tennis courts, then became used for croquet. There is now a children's play area where there was once a putting green, and back in the 1960s a golf course was created but this has since been removed. During the park's opening ceremony, a Mr Roundell made a speech that included the following quote ' . 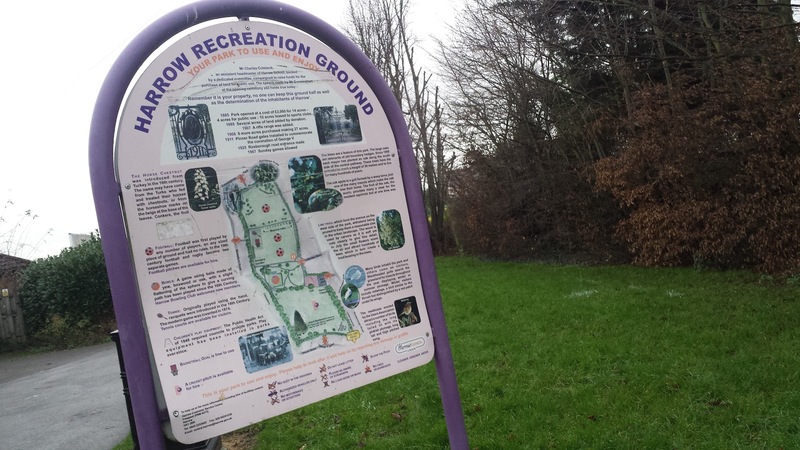 . . the pleasure of seeing dedicated to the use of the inhabitants of Harrow this spacious ground, where old English games of healthful recreation will flourish for all time to come'. 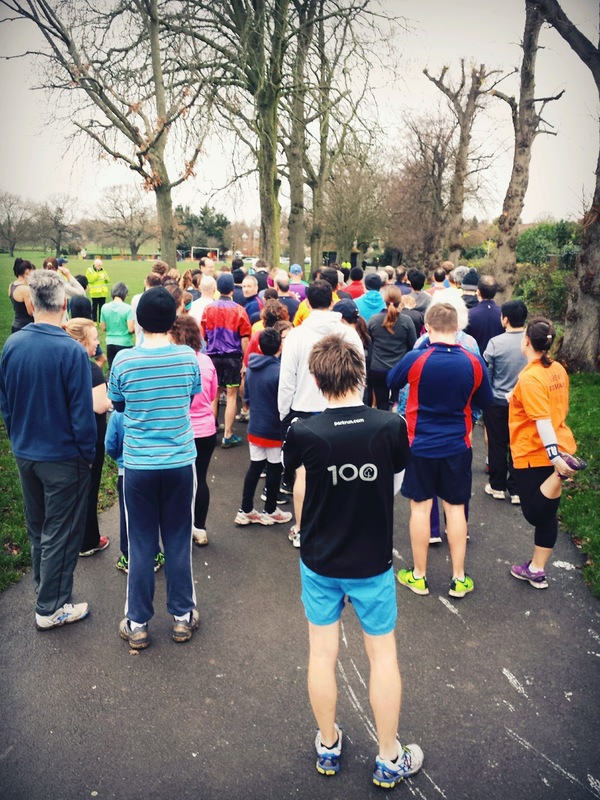 On 9 May 2015, Harrow parkrun had its inaugural event and it certainly is flourishing. 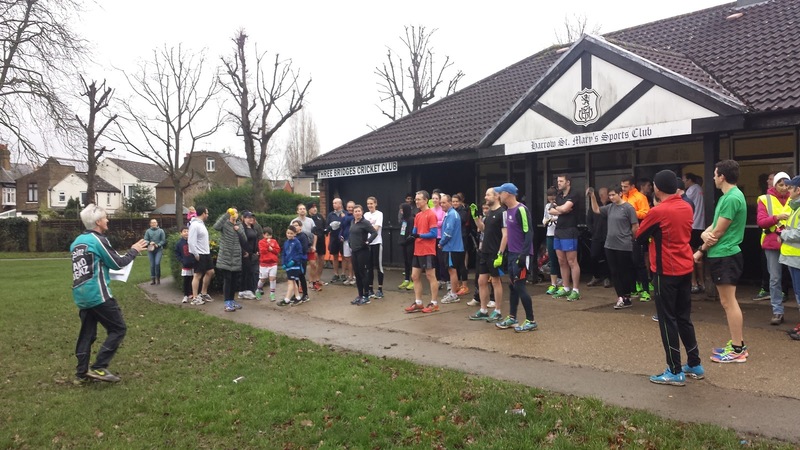 The event has been averaging around 100 participants per week and, like all parkruns, attracts a diverse range of people and abilities. The participants and volunteers gather in the south east corner of the park at the Harrow St Mary's pavilion, which is at the entrance closest to the town centre. Should you choose to travel to this venue by car, you will be able to park in the free car park which can be accessed from Roxborough Road. If you are using the train network you will need to make your way to Harrow-on-the-Hill station which is served by both underground and mainline services. We travelled over to the venue using the Jubilee line from Westminster and then the Metropolitan line to Harrow-on-the-Hill (change at Finchley Road or Wembley Park for a seamless transition between the two lines [don't change at Baker Street]). 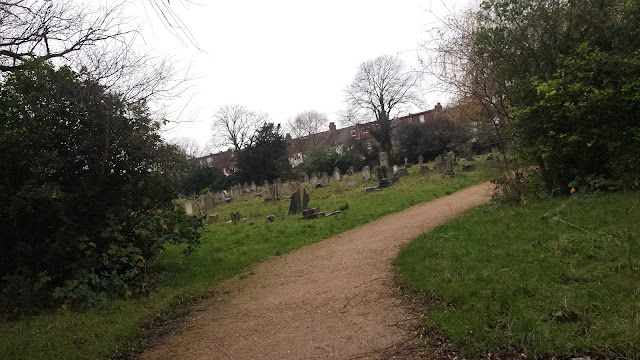 It's about a five minute walk from the station to the park. Toilets are available for use inside the pavilion building and after travelling on a chilly, semi-drizzly December morning we were really pleased to be able to leave our outer clothing layers and belongings inside a nice warm building rather than out on the damp ground. After a few words from the run director outside the pavilion, it was time to move across to the start line where the briefing continued. 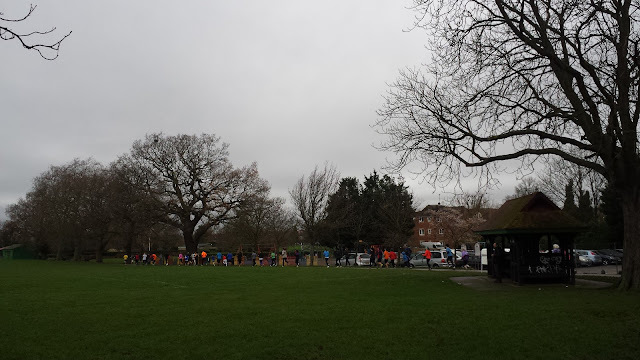 Then in true parkrun style the participants were sent on their way around the park for their weekly Saturday morning 5k. The run takes place entirely on tarmac paths with the only need to venture onto any grass coming at the very end in order to enter the finish funnel. There are three anti-clockwise laps to run, but the first lap is slightly different to the second and third. 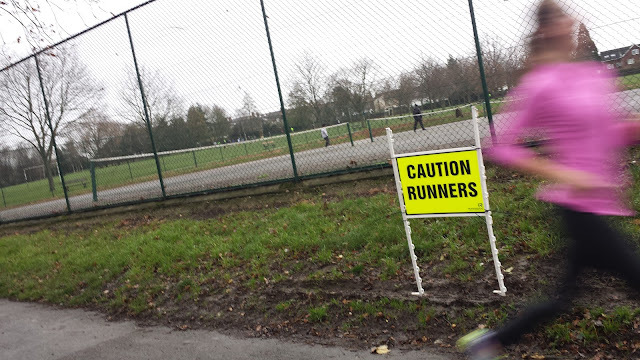 The course is perfectly suitable for buggy running and for wheelchair athletes. 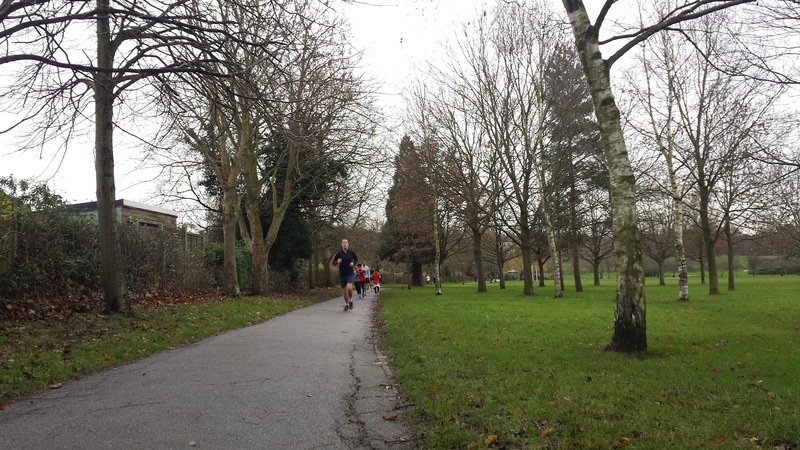 From the South-East corner of the park, runners head north along Lime Avenue before following the tarmac path round to the left, past the car park and the children's playground until swinging right to resume the northbound direction. 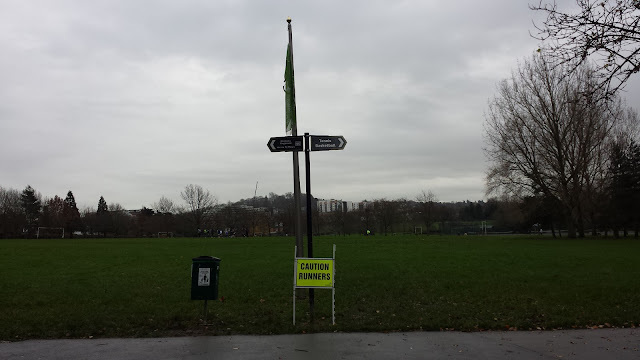 At this point on the first lap only, there is an additional, smaller anti-clockwise loop to run. 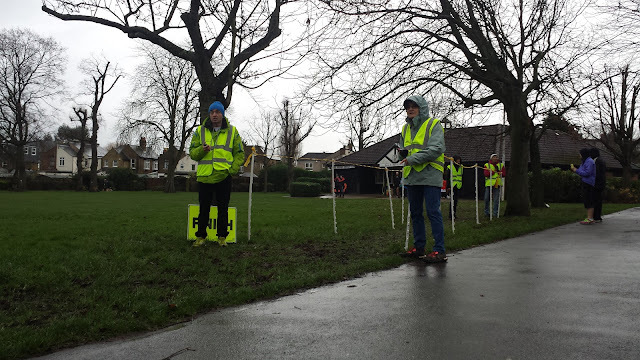 This consists of a left hand turn at the Hindes Road entrance (cones and marshals on hand to direct) which takes the runners towards and the around the bowling green. The path leads runners back towards the children's playground. Once back, the runners rejoin the perimeter path and continue as they were. This next section of the lap contains a fairly gentle incline all the way up to the North East corner of the park. Before reaching the end, they will pass the Mayoral Avenue where each Mayor since 1990 has planted an oak tree. At the top, the path swings left and the runners can let gravity do a little work as the gradient now takes them slightly downhill. Glancing left you can see across to Harrow-on-the-Hill and St. Mary's Church spire. Another left-hand turn awaits the runners at the end of this path just after they pass the outdoor gym equipment. Now heading South along the western edge of the park, the runners shortly pass the tennis and basket ball courts and the view across the open playing fields is exchanged for a short, cosier section in-between hedges. They then pass the sensory garden and the bowling green and after glancing to their right into Harrow Cemetery, the path starts to climb a little as the route heads towards the South-West corner. The final part of the lap has the runners following the eastbound path past the Pinner Road entrance, the gates here were installed to commemorate the coronation of King George V, and back towards the Harrow St. Mary's Pavilion where at the end of laps one or two, the runners will head back onto Lime Avenue to begin their next laps. Of course, at the end of the third lap it'll be time to stop running and the finish funnel is unmissable on the grass just outside the pavilion. We ran at event 32 and if you would like a closer look at the course my GPS file can be found on Strava via this link. Our barcodes were scanned just outside the pavilion and we then headed inside to change back into our warmer clothes. 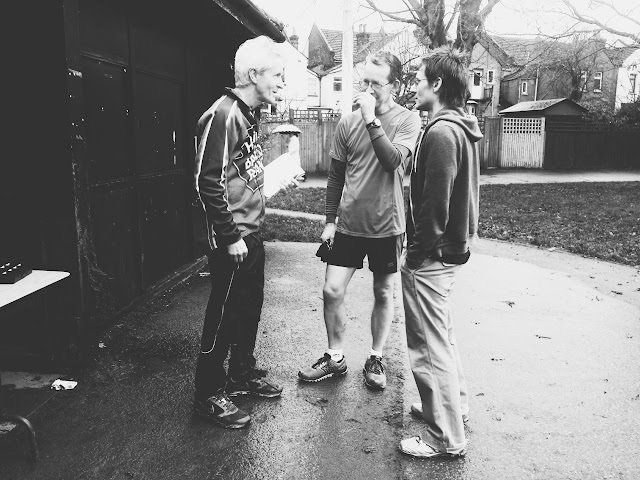 On the morning, we also bumped into fellow tourist and #7weeksofparkrun completer John Leonard and we all had a good chat to the run director Kevin (who gave us a mention in the run report) and some of the other volunteers before heading our separate ways. 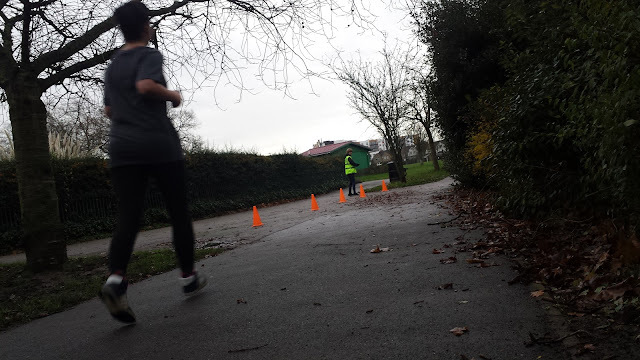 It was also a pretty special run because I regained my parkrun Lon-done* status. Sadly the post-run coffee arrangements at the pavilion haven't worked out quite as originally planned and at present there is no fixed post-run social to be had. Options for anyone that is looking for some refreshments would be to head across the road to the large Morrisons supermarket cafe or to head onto the High Street where there are some major coffee shop chains (we ended up in Costa). * Lon-done - the state of having run all of the Greater London parkrun venues.